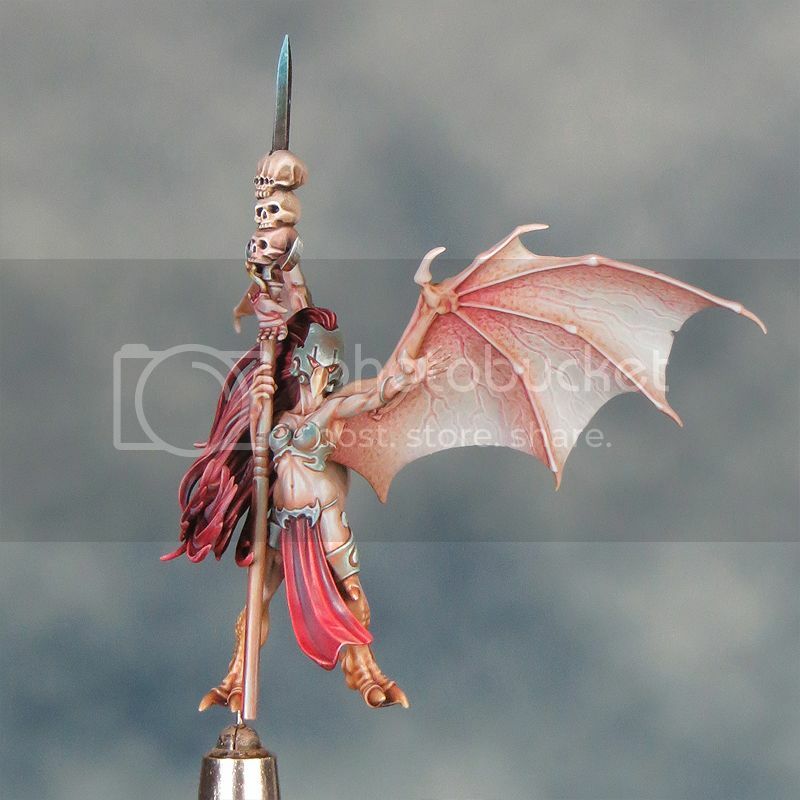 I want this third Scourge to match the first one I painted, but not to be identical so a little conversion is called for. I'm using the head option with the ponytail again. I really prefer it's sleeker look to the punk feathers on the majority of Scourge heads but I've swapped the ponytail with one from the wych box. 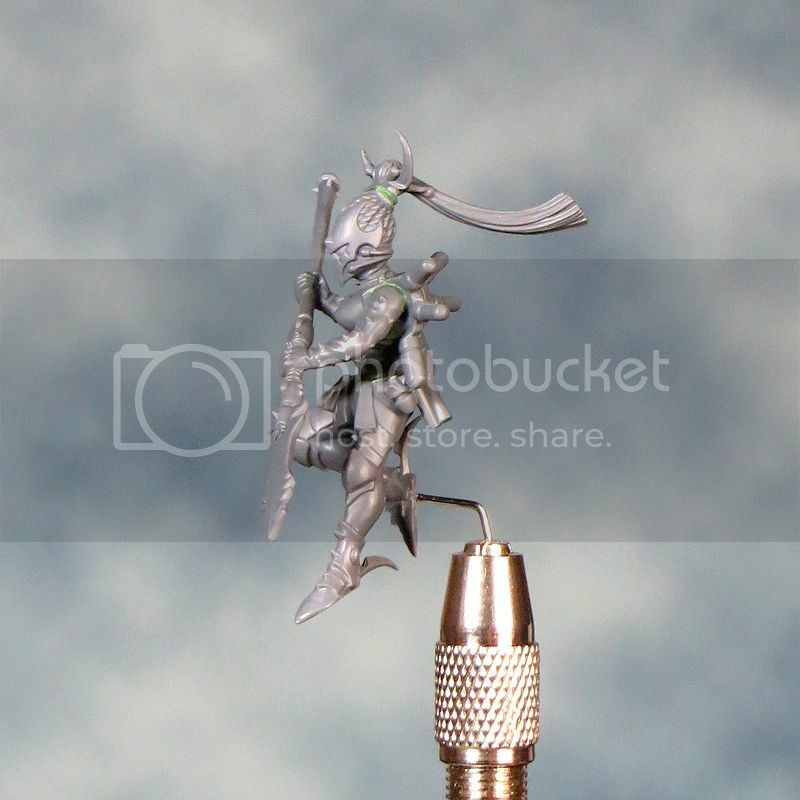 I also wanted to change the way the Scourge is holding her spear. As the Scourge minis only have one option in the box I've done some chop and swap with a Hellion to get a two handed grip on the spear. This has also enabled me to create something of a mirroring of the Scourge's positions. 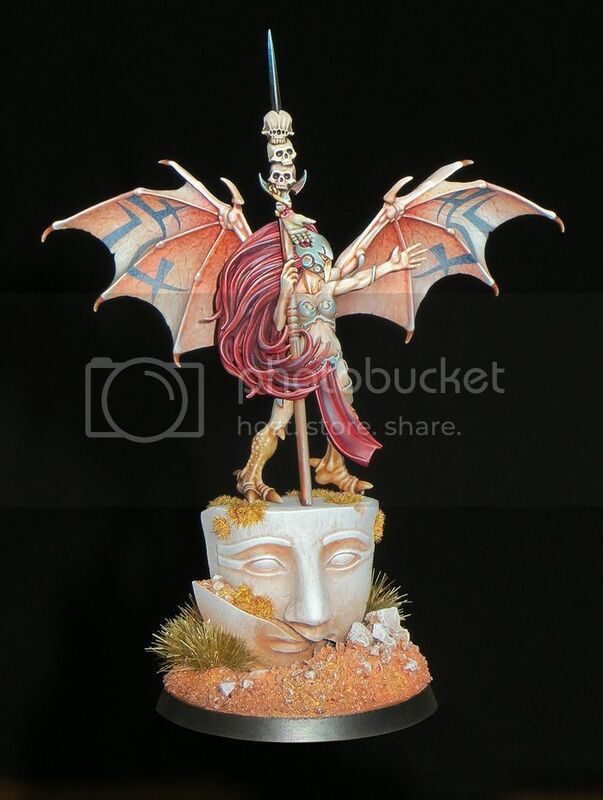 This will come into play on the diorama as the two of them will be roughly on either side of the 'Scourge Witch' and I think this will help to create an interesting symmetry. The wings haven't been fixed on properly yet. It will be a lot easier to paint them separately and then glue them in place. It seems to be all the rage at the moment and, despite being wary of simply following a trend for the sake of what's in fashion, I've been trying out a black background in my photos. I'm having a few issues with camera flash and lighting in general and need to experiment further but here are best shots I've achieved with a black background so far. I have very mixed feelings about the results and I'm not sure that such a strong black in the background suits my minis but the effect is quite striking. 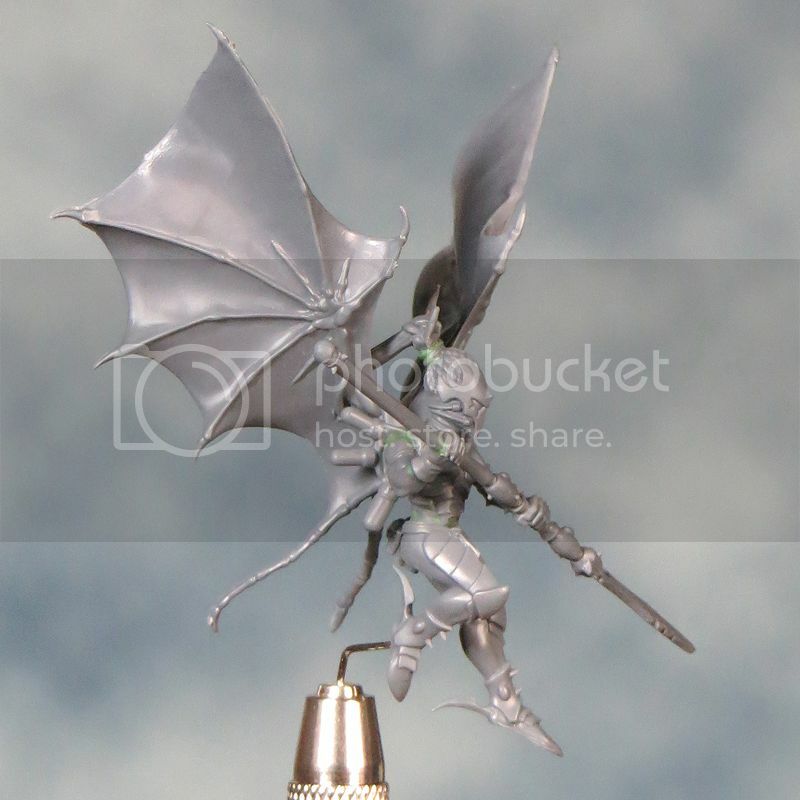 For the most part I think I just need to get used to seeing my minis presented this way before I make a final judgement. I've been back and tweaked a few things based on some really useful feedback from Coolmini but the Scourge Witch has finally come together surprisingly quickly in the end. The base is temporary for display purposes. I put it together very quickly using insta-mold to take an impression from an egyptian style ornament. I cast this up in plaster and after a little carving added soil and superglue to make the ground. I'm rather pleased with the result and I think it deserves the addition of a permanent resident atop it. 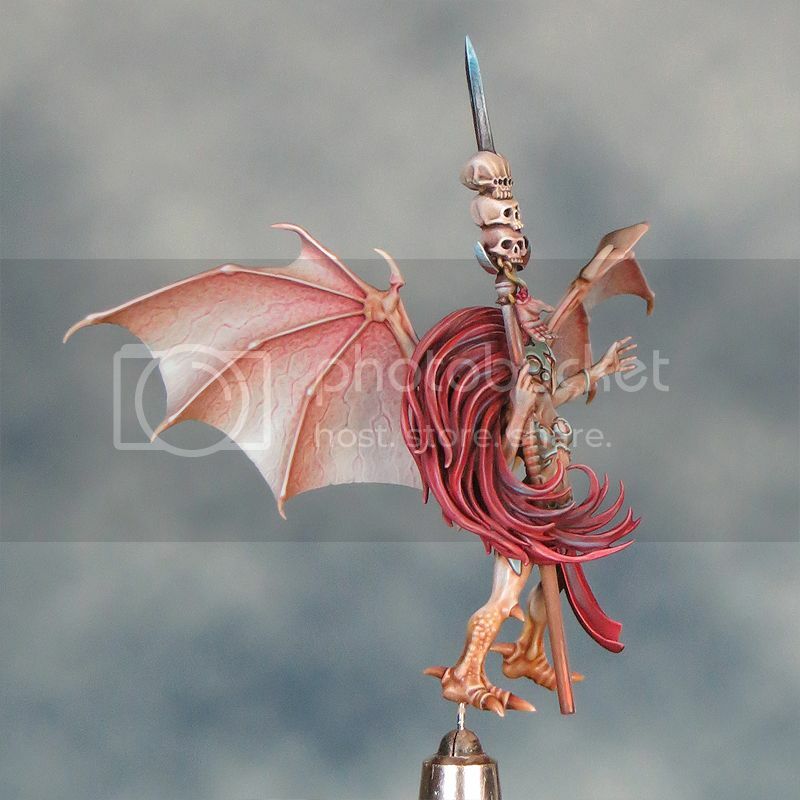 Progress on the Scourge has been steady with lots and lots of layering to get the wings looking right. I wasn't 100% happy with the inside surfaces of the wings but once the hands and fingers were properly shaded and highlighted it all came together so the bulk of the work has been spent on getting the outside painted. 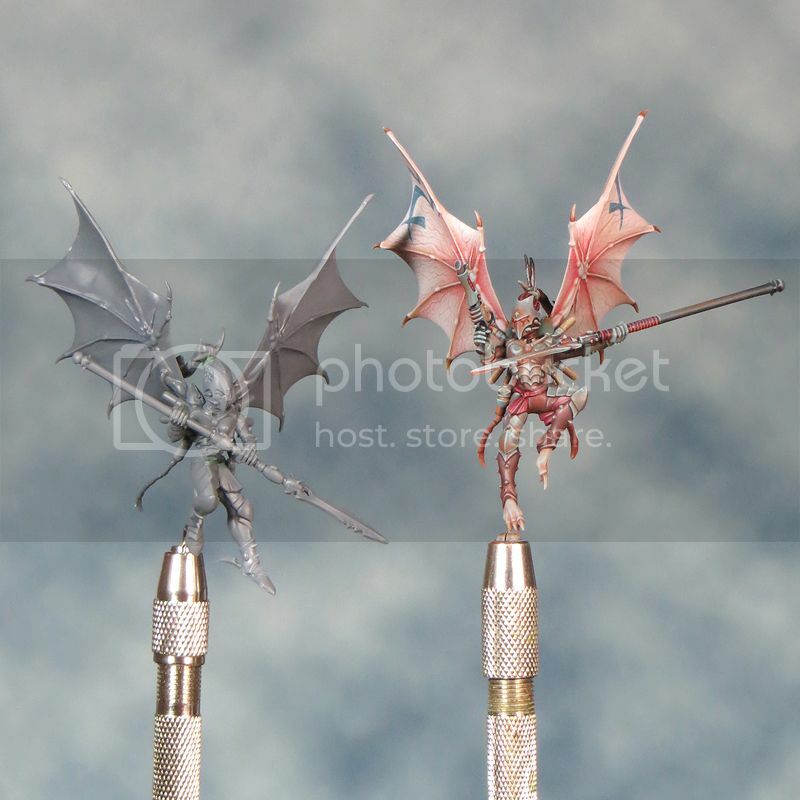 When Games workshop announced their new paint range I knew I was in for trouble of a sort. At the speed I paint I could easily foresee a time when, despite stocking up in advance, the colours I'd started using on this project would no longer be available. The time has come to start exploring new possibilities. There is certainly some inconvenience involved but in the long run I think the change is a good one for me. It's very easy to get stuck in your ways and keep falling back on the familiar. Knowing just how a particular colour will behave under different circumstances is particularly useful and makes it possible to really work that colour but it can also make you reluctant to try new things out. On the whole I think a fresh pallet of colours will encourage creativity and experimentation. As I've said before 'nothing ventured - nothing gained'. 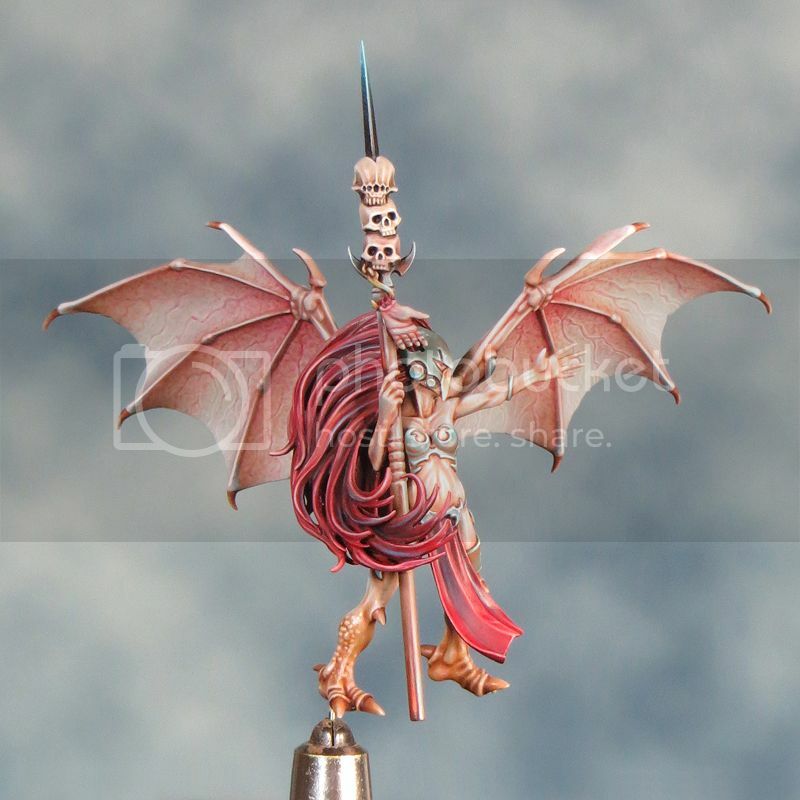 My immediate concern has been finding alternatives for some of the colours used on my Scourges. 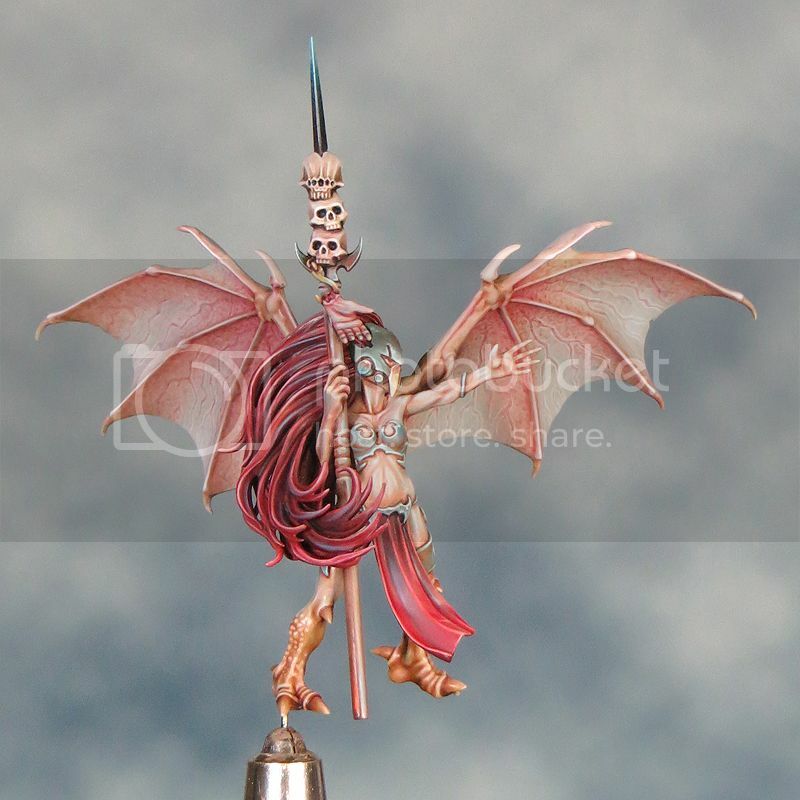 I've used a lot of Dheneb Stone in the flesh tones and needed to find a good match so I could complete the wings. 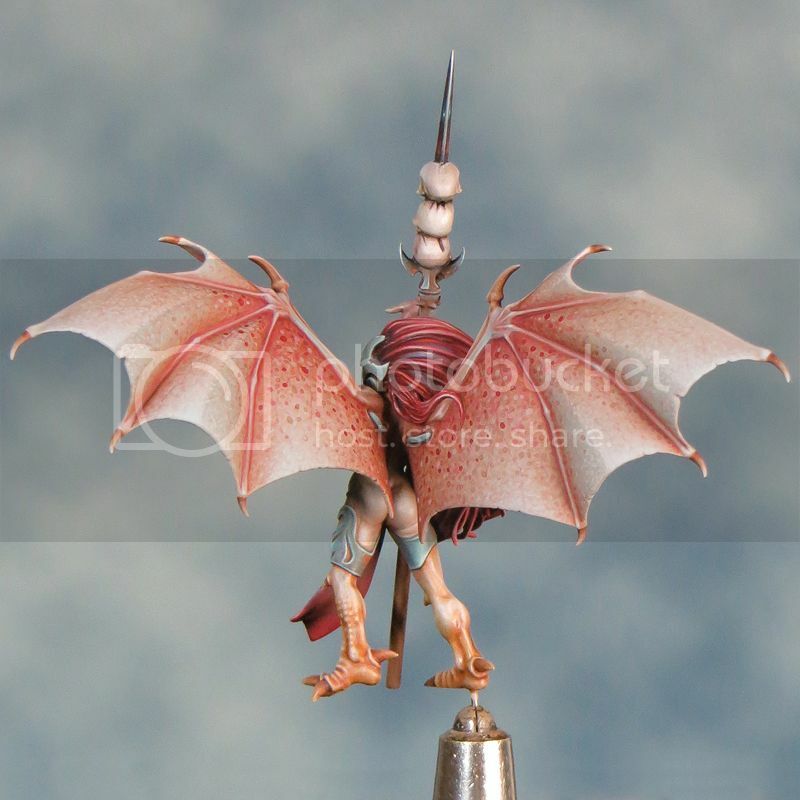 Thankfully in this case GW have provided and the new Rakarth Flesh is perfect. It's a slightly deeper shade than the Dheneb Stone but that is no bad thing and most importantly it gives the same results as Dheneb Stone did when mixed with the other colours I've used in the flesh tones. 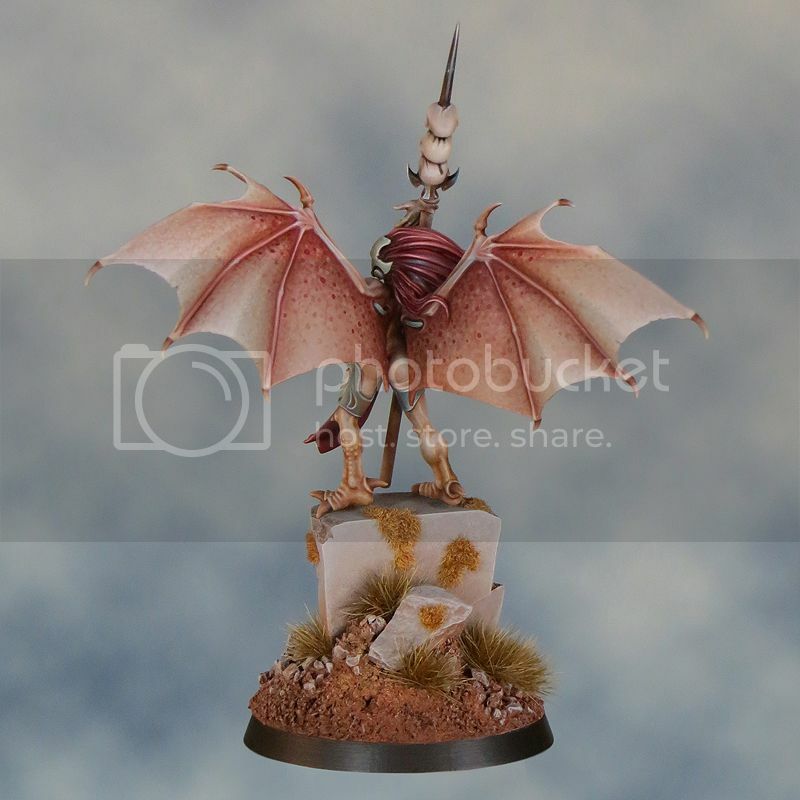 The next challenge is to find a good replacement for scorched brown as I've use it in the armour and I need to make the next Scourge (I've already started prepping the mini) match the two done so far. The best new GW equivalent seems to be Rhinox Hide but the similarity is superficial. This is a very different colour to Scorched brown and seems to include bit of black in the mix. This becomes even more apparent when you start mixing it with other colours. Scorched brown contained a fair amount of red in it's makeup and could give some unexpectedly pinkish or purplish tones depending on what you mixed it with. Rhinox hide gives muddy greyish tones under the same circumstances - not well. All is not lost, as I believe I've found a solution. Valejo Model Color Panzer Series 70985 Hull Red seems to provide what’s needed. The colour is not an exact match but my initial tests are very promising. This brings me to another of benefit brought the enforced change. 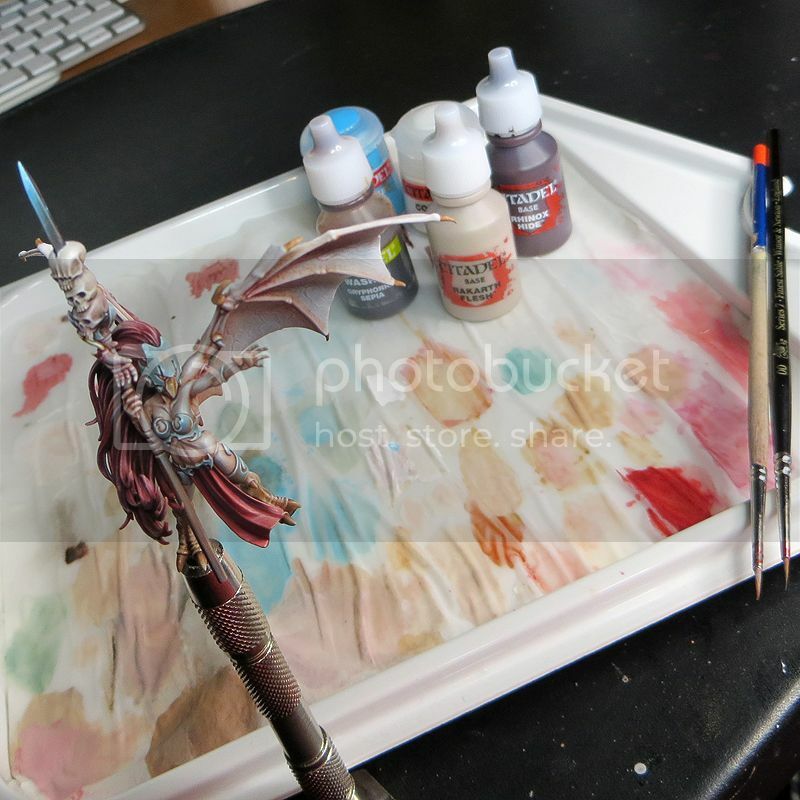 I've expanded my use of paints beyond the GW range to include those from other companies - and about time too! 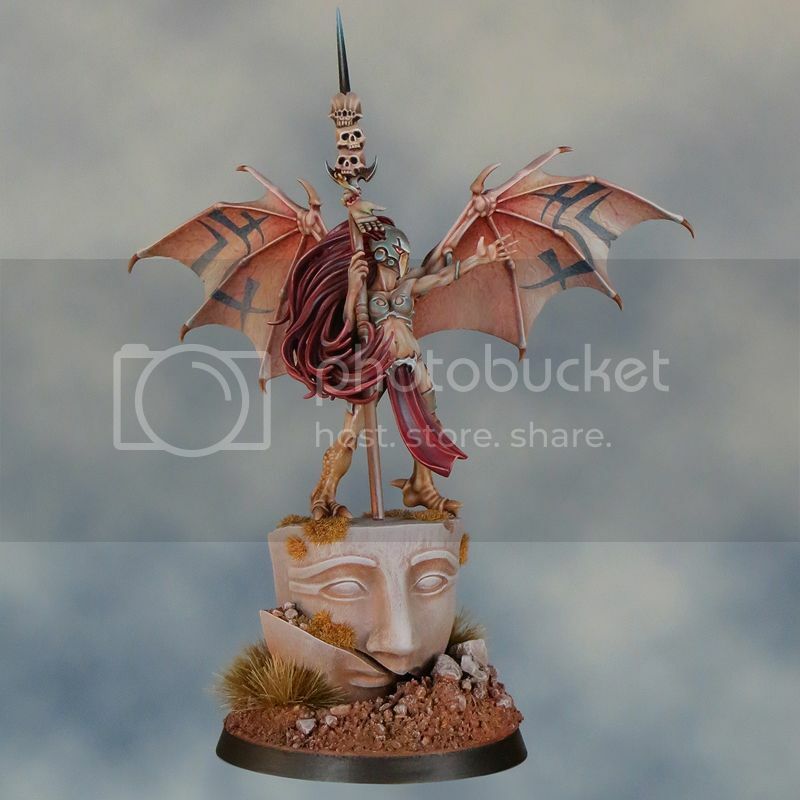 I'm no GW basher and I'm a big fan of their paints but I can't help noticing how they charge more money for less paint. I'm also transferring my GW paints into dropper bottles. It’s a little fiddly to do but I find dropper bottles so much better for ease of use and practicality than the GW pots. 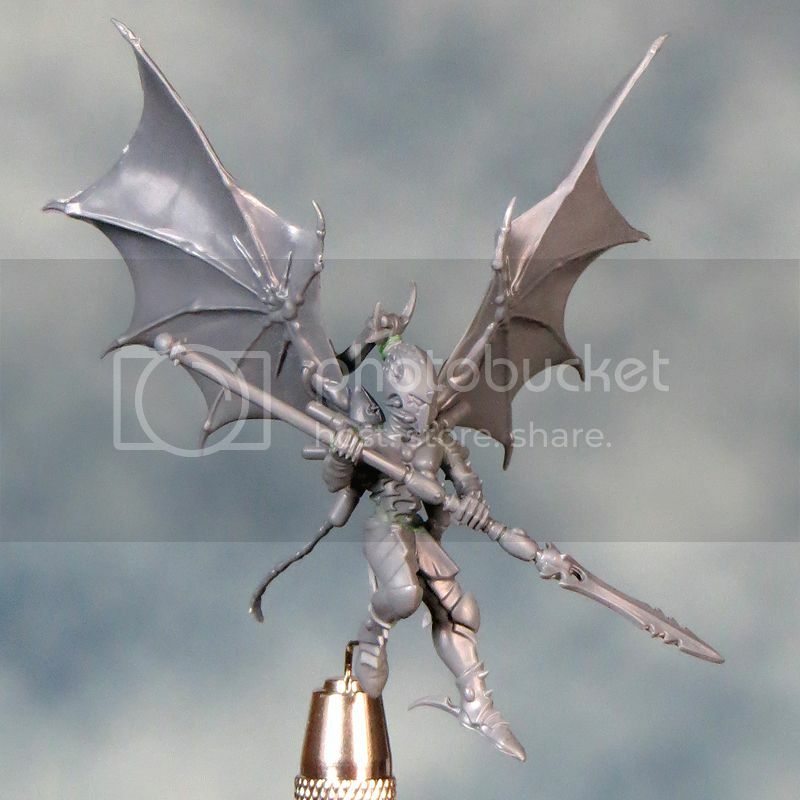 With the Tomb King finished I can return to painting my Dark Eldar Diorama and more specifically the wings on my custom Scourge /Witch. 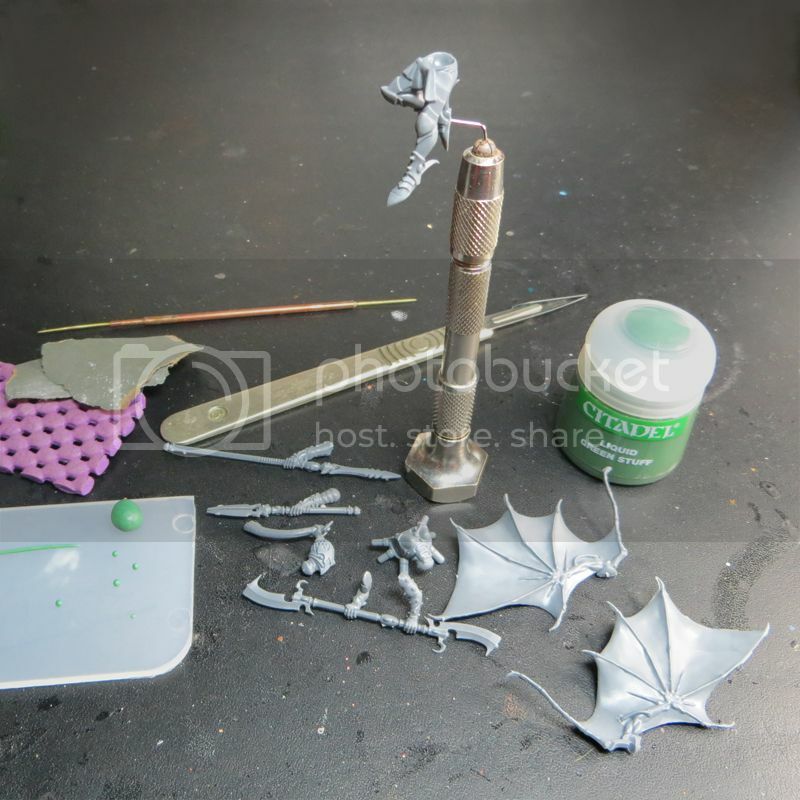 It's been a year since I painted the wings on the first Scourge so I've turned to my own Tutorial to make sure I follow the same technique. I have to confess that consistency is something I've always found especially difficult. 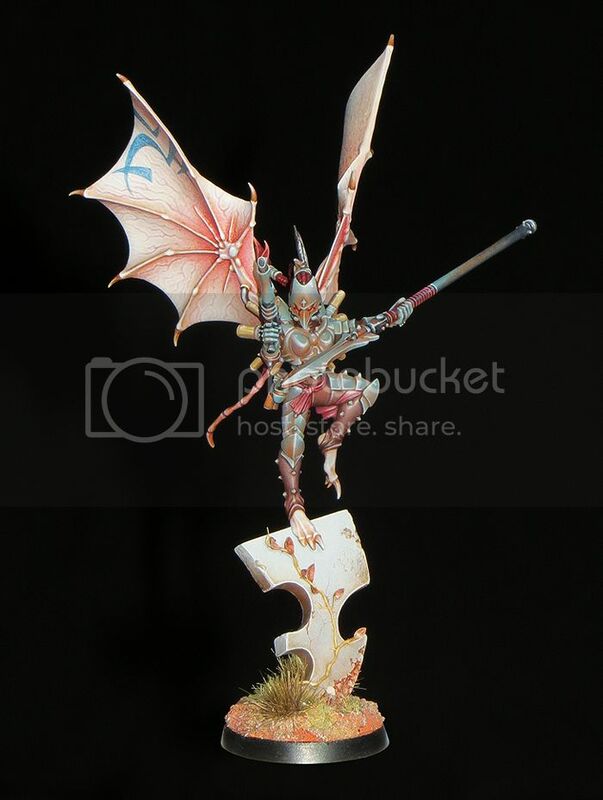 I have a very low boredom threshold and once I've painted a mini I want to move on and try something different so painting a 'flock' of Dark Eldar Scourges presents quite a challenge to me. This will be the first time I've ever painted a unit of any sort. After a frustrating start the insides of the wings are starting to come together and need just a little refinement before I move on to the outside surfaces. I've found that I need to take my time over these, painting a little and then setting the mini aside for a while before continuing. This helps me to take a fresh look at the paint job after each pause and asses the next step.